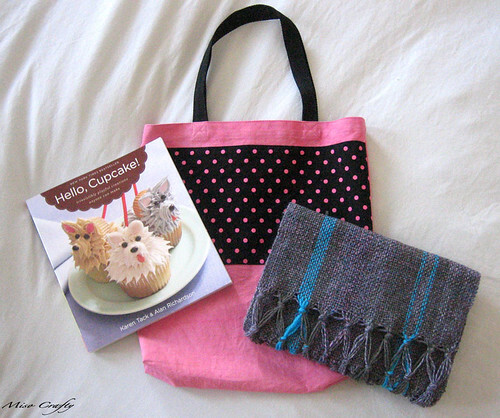 Miso Crafty Knits: Blogiversary Giveaway! 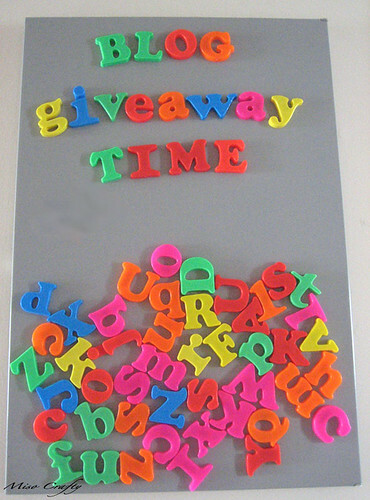 Ok, as promised, the 2nd blogiversary giveaway! I'm going to be to the point and just say that I wanted to include something that involved sewing, something that involved baking, and something that involved yarn (as much as I would have loved it to be a knitted item, I'm not in any way a fast knitter and I would like to do this giveaway this year!). So voila, I present the goods! - The fabulous Hello, Cupcake book. My own copy is full of Post-it notes and drool marks! - A scarf I wove specifically for my blogiversary! And who knows what other goodies I may just throw in! Now all you have to do to win is to leave a comment on this post about what your favorite craft is. Simple as that! I'll randomly draw a name one week from today, that's Friday April 23, 2010. Just make sure that there's a way for me to contact you, if you are on Blogger make sure that I'll be able to see your profile and info, and if all else fails then leave a comment then send me an email (you can find my email over on the left). Great giveaway--that is a beautiful scarf! me! me! me!! pick me!!! um... my favourite craft is knitting :) I hope I get the prize! happy blogiversary!! my favourite craft at the moment is sewing. I am having so much fun sewing up new clothes. My favourite craft is crazy patchwork. Pick me! Pick me! I love to crochet. I just learned a year ago and I can't stop. I have never stuck to a crafty activity for so long. I love all the possibilities that crochet has. Just found Your blog today and I really like it. hi kwanny!! my favourite craft is baking....is that considered a craft? oh well, i love it! and i want that cupcake book! Lately, my craft/hobby has been cooking, of sorts. I've been learning how to grow more food and preserve it myself. I've also been learning how to make butter (from cream) and bread (by hand, and wean myself off my bread machine). While I've been learning other crafts (papermaking, embroidery, papercrafting...), I always come back to crochet. I crochet for myself, for others, to keep sane during all-staff meetings at work, and just so I have an excuse to fondle the yarn sometimes. oOlala! I would love the cupcake book :D I love baking. I love the scarf, the weather just turned back toward winter again here in Maine so I would totally get some use out of it! 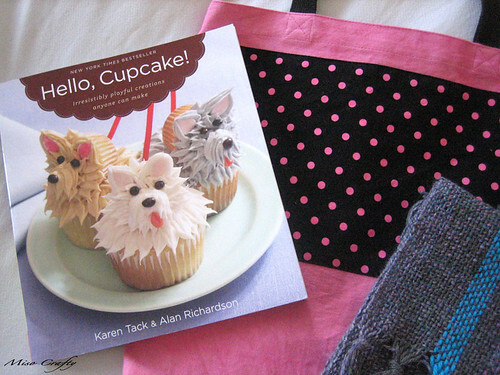 The book looks cute too, I am taking a cake decorating class next month and I bet the book would be a fun thing to bring! My favorite craft will always be sewing. I am still ecxperimenting with quilting but I love to just knock out a tote bag or pot holder every sometimes! I love sewing because it can be very simple or very involved, and I can choose my depth of project depending on how I feel that day! Thanks for the chance at your very generous giveaway. Hello, my favorite craft is knitting. Knitting is my fav (of course!)! But I also love beading and baking, when I have time. My favorite craft is cooking. Congratulations on your blogiversary! tis knitting all the way with me, though I do like a little cross stitch and am considering quilting. That cupcake book looks adorable. at the moment ? knitting and crochet hands down, but I've been a very prolific quilter for nearly 3 decades and that still is a major love ... and then there's spinning, the newest love ... and dyeing which relates to all of the above.